You been snapping away in a frenzy but just cannot seem to get that perfect selfie. It is very frustrating but don’t despair. There are technical aspects that one can use to master the art of the selfie. Before even remotely thinking of taking a selfie you need to have a decent light source. Don’t expect taking a selfie in a dimly-lit room or under the harsh white light of a fluorescent light to produce a perfect selfie. Move to a brighter location. It is particularly important that you avoid creating a silhouette with the direction of light. Always keep the light source in front of you which prevents shadows being cast across your face. Try to use natural light as this is the most flattering. The best time of day for getting good natural light is one hour after sunrise and one hour before sunset. This is when the natural light is not so harsh and yields a more realistic coloring than artificial lighting. If you notice that the photos are too dark on one area of your face you can bring a second light source to lighten up the shadowy areas. Photographers use special light stands and light diffusers often from two or more sources of light to soften the subject. This equipment can cost thousands of dollars but there are ways to improvise. If you are indoors, use a thin curtain to diffuse the sunlight or single source of light. Using a makeshift diffuser like a professional photographer helps to soften the features of your face, making the facial lines smoother and overall improving the subjects attractiveness. Avoid at all costs using the cameras flash, it will instantly create a glare on the closest thing to the camera lens. Did you know that just a few degrees in the tilt of your head can be the difference between the dreaded driver’s license photo and the ultimate selfie? Consider the features of your face and which you want to highlight. Do you have a ‘good side’, a side that is more symmetrical and balanced? Maybe you have amazing eyes or beautiful lush lips. Experiment with the angle. For most people, the best angle is one that is just above their line of vision. Aiming the camera above yourself, pointing down, will exaggerate the size of your eyes and give the impression of a slender chin. This is a commonly used angle which helps you avoid the ‘pig nose’. Turning your face to the left or right slightly can make your facial features less flat and build depth. They are generally more interesting than a straight-on selfie. Holding you camera with one hand and clicking can be a lot harder than the celebrities make it look. An unsteady hand is a guaranteed means to producing a whole lot of blurry photos, not one of them worth a second look. To avoid the unnecessary heartache, try using two hands to steady the camera or consider install an app such as SelfieMatic for iPhone. The app automatically takes photos, using motion sensing algorithms and face detection technology. SelfieMatic takes the picture without you clicking a button, making it really easy to capture the best selfie. If you are using a phone, you can use front facing camera to steady the shot and take the picture but these are lower –resolution and the back camera is the preferred camera to use for high resolution selfies. Alternative options are to ask someone else to take the photo for you if available or to invest in a selfie stick. 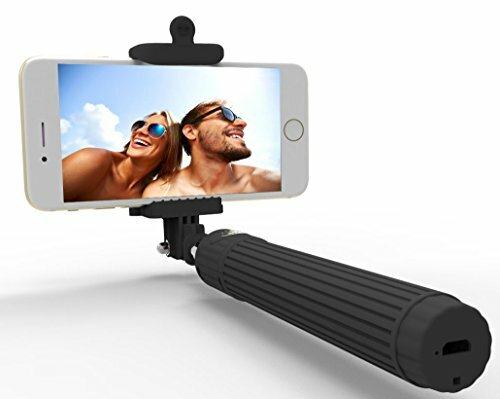 A selfie stick used from above or any angle, can give the ultimate selfie because the camera lens can be placed further away and not give a distorted perspective. The best selfie stick on the market! Taking selfies is hard work! Chances are the first photo you took wasn’t the best neither was the next three. Luckily we live in a digital age and don’t have to worry about the cost of developing the photo film. To take the ultimate selfie you will need to take multiple shots and access on the fly what is the outcome. Perhaps it is too dark, bad angle, blurry or shows your underwear lying on the floor. It is important to set the stage right for that perfect shot and make adjustments. Take multiple photos and you might have a gem in that collection which you can clean up in the editing phase. The best selfies use their background to enhance the subject. Choose an interesting background and position yourself in front of it for people to see. There are an incredible amount of options available to frame your selfie. Outdoors you will be able to make use of the natural light under a tree or in front of a vineyard. Indoors can provide more interest but be warned to make sure the background is suitable. The internet is littered with shameful selfies where the room is a mess. Unless you going for the full-body selfie shot, avoid using a mirror to take your shot. Mirrors will reverse the picture and your camera will be visible. Mirrors will like give a glared appearance and distort the image. Some backgrounds are considered off limits such as the scene of accident, funeral or police crime scene. Similarly taking a selfie while driving a car is also considered irresponsible. Finally watch out for the pesky photo bombers who aim to ruin your ultimate selfie. Keeping still is simple yet incredibly important. When you are alone you have to rely on yourself to get the job done. It takes some practice. Holding the camera in your outstretched arm, at the perfect angle can be tiring while holding a pose. The best advice is to visualize all aspects of the selfie before you take it then take a deep breathe, relax, pose and click. All this happens is a few seconds. The result should be crisper and cleaner photos. The very last step, just before you take the picture is to direct your eyes towards the camera. It is best not to stare directly at the lens of the camera. Most people don’t look great when looked straight on. What works for well is to turn and/or tilt your head a little bit and look slightly to the left or right of the camera lens. This is less intimidating to the viewer gives a more natural look. Most phones have apps already installed to add light or color filters, which can dramatically enhance the look of the selfie. Photos that you thought were destined to be binned can be brought to life and even become the best picture of the bunch. However it does take some time fine tuning and you unfortunately won’t be uploading to social media instantly either. In terms of lighting one can edit the brightness, contrast and even brighten up shadow areas specifically. Color saturation can be boosted and contrast altered. Typically photos can be converted to black and white, where even the grain size can be adjusted. If you not in the mood to fiddle or time is of the essence, one can normal select a premade filter which can instantly glam up your selfie. If adding filters is not enough, you can download your photos to a computer which has photo editing software. Here the software can crop, resize, cut out parts of the background you don’t want, soften skin blemishes, the list is endless.